My 21 year old Ficus Retusa (?) looks like it is dying. I have had it for 2 years but recently the leaves have been turning yellow, turning brown and generally looking awful we turn down the thermostat in the house to 60 degrees at night. Could this be the problem? I fertilize weekly as I have been told to but the expert I was using went out of business. I live near Buffalo so the sunlight is reduced in the winter. This is my "Cancer tree" that I got the last time I was diagnosed with cancer. Last year some of the leaves fell off but not this bad. It's been my experience that ficus do not need (should not have) excess amounts of water in the house. I would keep it on the dry side and let it get mostly dry before watering. You can place a bamboo skewer in the soil to more accurately check moisture level. 60 degrees should not harm the plant. Good luck. Hi, Light and watering are most likely the issue here! We, who live in the north, cannot rely on the sun for our tropical bonsai. I use florescent lights for all my ficus. Keep the soil fairly dry (light watering every three days) and don't fertilize but once a month with a weak solution. Another issue may be the soil....it must be fast draining,I use pure lava rock, plus the pot should not sit in the run off! Good luck and hope your ficus gets well!!!! just follow the above advise and just like you, they will spring back to life in spring. Same problem as the 'Kumwuat' Not enough light and air movmement...and indoor heating! You guys should follow what Yvonne did in Sweden with her tropicals.....see how much light she gives them. I think the thread was called, Ficus in the cold North.. I agree with letting the soil dry somewhat between waterings, but I have noticed much fuller and healthier looking foliage with the addition of humidity in my grow room. I have a humidifier that runs around the clock and I keep the room at about 50-60% humidity. and it worked. I think that the bleach does something to the iron in the soil and makes it available to the tree. I've only done this with ficus but that is what you have. Best regards, Bob T.
I have never heard of using bleach but many in my club used 1TBLS. vinegar in the water for tropicals. I still do this once a month. The city water is very hard and the vinegar changes the ph. I've tried vinegar with acid loving plants. I don't think the ficus has a ph problem. I live south of Buffalo and the nursery/greenhouse was located in Salamanca, NY. It was a tropical paradise but it's been gone for over a decade. I can't remember his name but he knew how to grow all kinds of plants. The other problem could be the cold night temperature and maybe the location of the tree. I don't think ficus like drafts either. Hi Bob, I have a small tropical room in the basement where I combine florescent lights and a hi intensity metal halide with a hi pressure sodium grow light. Winter in Minnesota is like living in a freezer and the small tropical room is not heated so I leave the halide (high heat) on at night when we have our yearly deep freeze! The only tree that seems to suffer is my buttonwood that was very old when I bought it 25years ago. It sheds leaves but revives in the summer. I really like the idea of a small humidifier and will be adding this for a real tropical experience. You've had your ficus a long time, the problem is not your water. My best guess is that the problem is temperature. Ficus only grow rapidly during warm temperatures above 70 F, at cooler temperatures growth slows, and will stop somewhere near 65 or 60 F. If your thermostat is set at 60 F, it is very likely your tree near the window is quite a bit cooler than that. This in its self is not lethal. 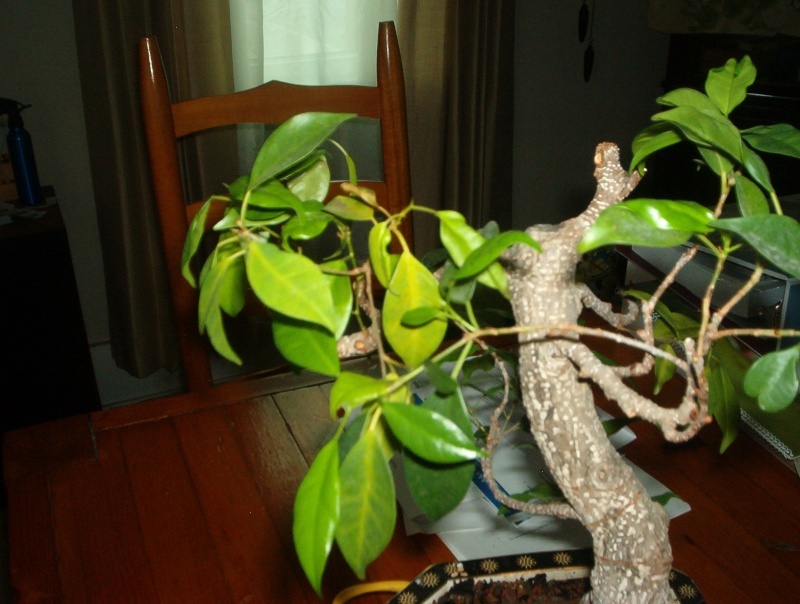 Most ficus will drop some leaves and sit semi dormant until warmth returns. However, when a tree is not growing it should not be fertilized. Stop all fertilizer until you see new shoots starting in spring or early summer. Flush it a few times with clear water, no added fertilizer, then for the remainder of winter allow it to be somewhat on the dry side. Pick up watering when new buds appear and start to grow. Don't repot, or prune while the tree is sitting dormant. The tree won't respond well to disturbance while dormant. 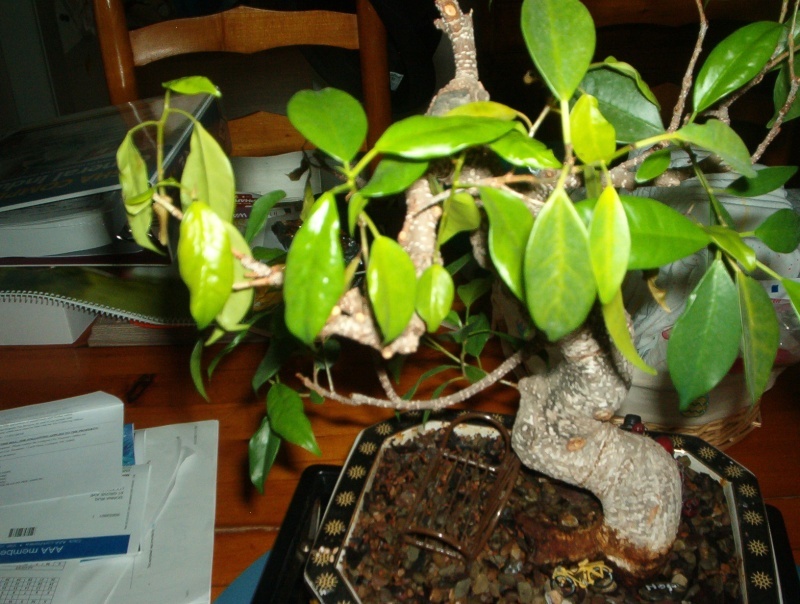 I've lost ficus from repotting in cold weather. Don't panic if your tree looses many leaves, I have had ficus sit over winter completely leafless for 3 or 4 months, then when temperatures were above 70 F again, it suddenly produced buds and grew. They are tough trees, and are adapted to survive in wet-dry low elevation monsoon influenced tropical climates. So the good news is, I don't think your tree is dying. It is just doing what ficus do then its too cold for them. Dropping leaves and going dormant. Just let the soil get dry between watering, and you should be fine.